A demo app for the Yvolver business development team. Quick, simple, and straight to the point. 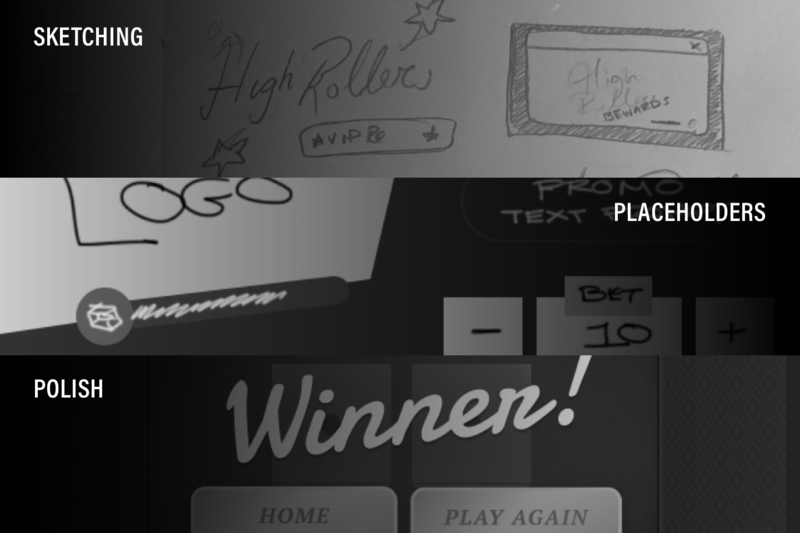 The Yvolver business development team needed a simple mobile game for showing our adtech platform to potential clients. In the past, the BD team tried to demo our product on an infinite runner game, but the gameplay was too time intensive and felt awkward during demonstrations. Even then, the game's custom setup couldn't display all of our product's engagement capabilities. Enter High Rollers. This demo app needed to be fast, concise, and flexible. I paired with a developer to define gameplay, aesthetic, consumables, and triggers for the Yvolver platform. Heads down and focused, we were able to put this together in under a week—the BD team were our new best friends. With such a short turn around window, design and development worked simultaneously. While I crafted visuals the developer hooked up gameplay. Once we established the rough UI, I generated placeholder graphics to use in the code. Final visuals were added in the last stage of development. In retrospect, this was one of my favorite short-term projects. By prototyping the rough UI and being intentional with scope we were able to catch difficulties early on and tweak the design as needed to finish on time.